Even if Fed-surcharges are fully incorporated into post-stress capital requirements (as suggested by Governor Tarullo last Monday), BAC can repurchase $9-10bn of stock in each of 2016 and 2017. Along with an increase in the dividend yield towards 2% in 2017, this raises the net payout ratio to 75% from <25% in 2015. (The payout would be higher but for assumed losses in other comprehensive income of $4-5bn annually as rising rates generate negative marks on the available-for-sale securities portfolio). 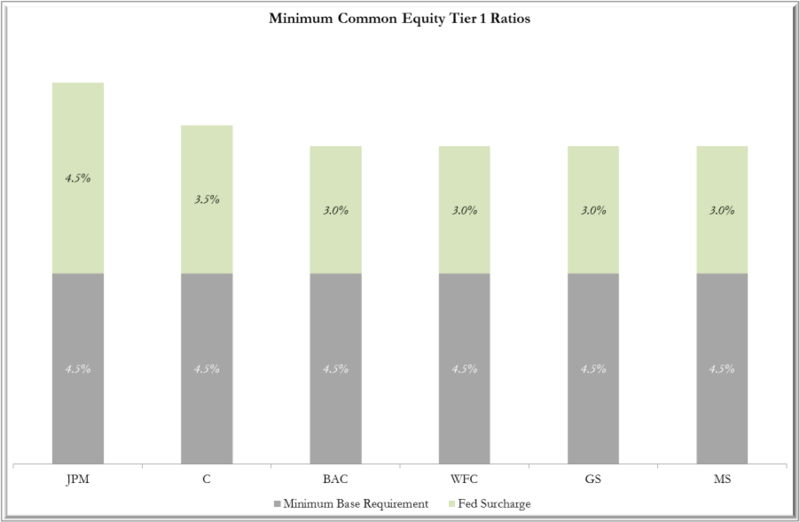 In its mid-cycle stress test, BAC self-reported a minimum common-equity-tier-1 (CET1) ratio of 7.3% versus a requirement of 7.5% if the Fed surcharge of 3% is added to the Basel 3 base minimum of 4.5%; our model allows the CET1 ratio to increase by 40bps through 2016 (vs. the 10.4% level of 2015Q2) to close this gap at the same time as absorbing a $170bn increase in risk-weighted assets in 2015Q4 given the adoption of the advanced approaches methodology (mitigated by risk-optimization through 2016 so that RWA fall by $60bn in 2016 to $1.5tn at year-end). The increase in payout is important to allowing BAC to move towards its target for a return-on-tangible-equity (ROTE) of 12-14%, versus 10% in 2015, and hence a valuation re-rating. Specifically, we expect the firm to generate an 11% ROTE in 2017 corresponding to a multiple of 1.3x tangible book and, given this will be $16.7/share at end-2016, a price-target of $22. BAC targets a return-on-assets of 1% implying a ratio of tangible-equity-to-assets of 7.1-8.3%. The ratio was at the high-end of this range at end-2015Q2 and we expect it to rise to near-9% this quarter given the RWA addition for advanced approach adoption. Over the next two years, BAC’s ability to buy-back stock will be funded in part by the issuance of preferred stock as it increases additional-tier 1 (AT1) capital from the current 1.2% of RWA towards 1.5%; specifically, we model AT1 issuance at $2.5bn in 2016 and $2bn in 2017. 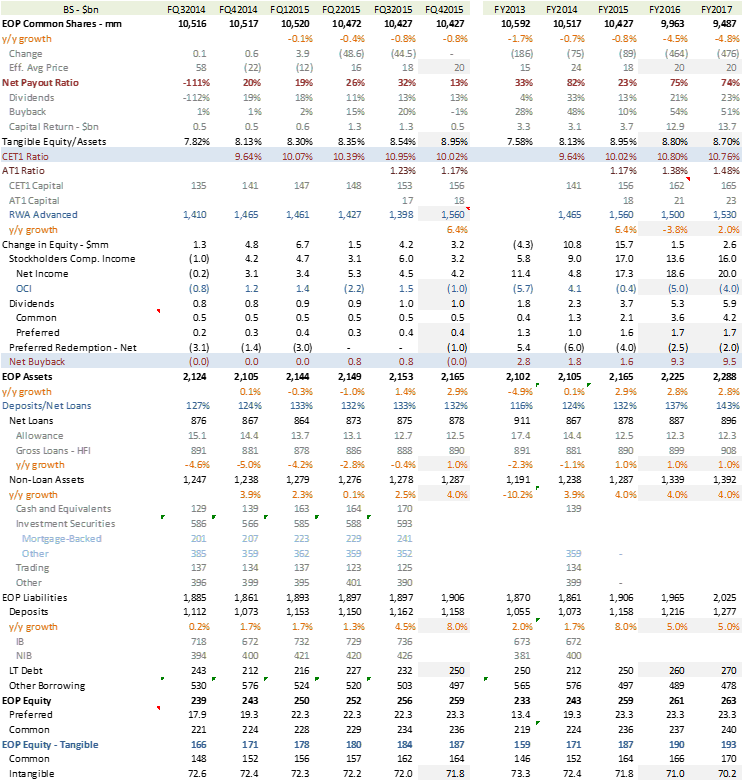 BAC continues to be our favorite bank-name given the operating leverage created by rising short rates on a low-beta deposit franchise acting over the expense-saves from continued run-off of legacy mortgages. 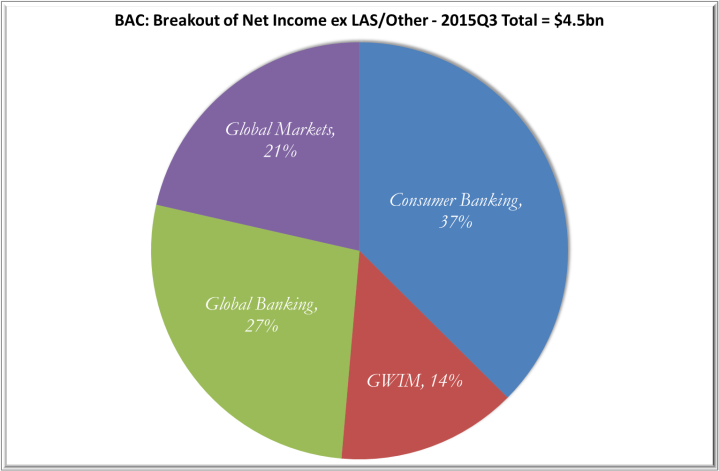 Deposit-sensitive segments, so consumer banking and wealth management (GWIM), account for over half of earnings before the legacy asset services (LAS) portfolio and corporate/other (see Chart). In the event short rates disappoint, stock buyback can itself support 4-5% EPS growth with expense-saves, volume-growth, and fee-generating representing additional levers. Indeed, we believe BAC can meet consensus EPS with margin increases of just 5bps in each of 2016 and 2017 and that, in practice, 10bps is likely in 2017 contributing in our model to a dime beat in 2017 EPS of $1.83. The end of easy money, which has suppressed chain-bank earnings from both deposit and trading franchises, will raise profitability and hence valuation multiples. Even if rates are lower for longer, earnings compares are now easier given a declining headwind to loan-growth as legacy portfolio run-off nears completion and given achievement of a new-normal for investment in controls and digital channels on the expense-side and for regulation of consumer fees on the revenue side. However, the leverage to rising short rates is enormous; at BAC, for example with $1.8tn of earning assets, each 10bps increase in net interest margin generates 12 cents of 2016 EPS on a consensus-base of $1.57; and the net interest margin has declined 15bps since 2013 alone to an expected GAAP-level of 2.15% in 2015. 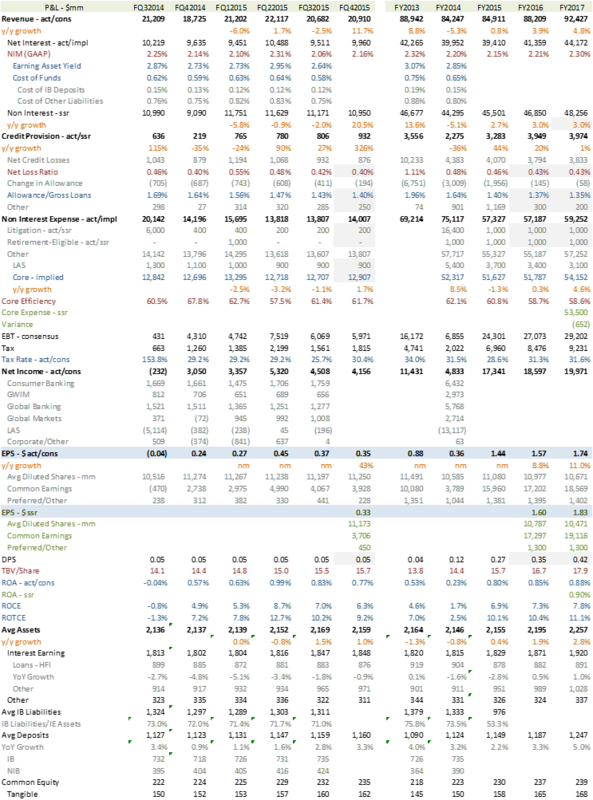 Beyond the upside to revenue, there is significant capital leverage particularly at C and BAC which are trading at or around tangible book value (0.9x and 1.1x respectively). 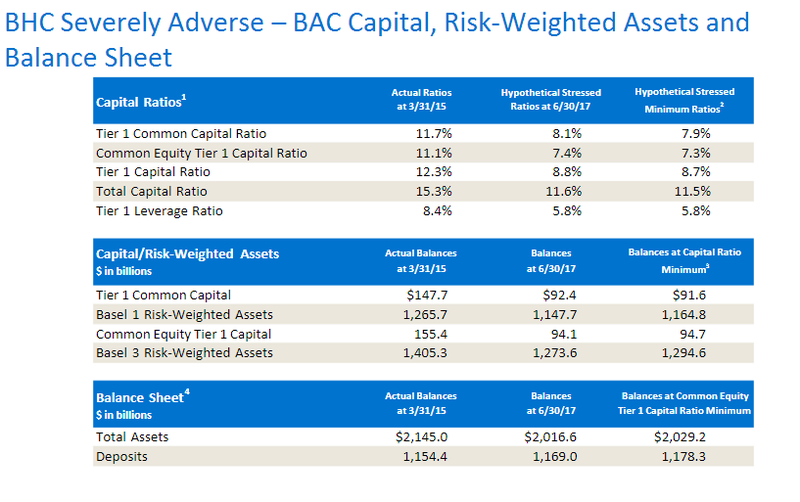 In the case of BAC, the capital leverage has been masked by the transition to a new regulatory regime, the “advanced approaches” methodology for calculating risk-based capital ratios, which completes this quarter. To quantify the impact, we note that BAC will generate over $18bn of common-equity-tier-1 (CET1) capital in 2015 but buyback less than $3bn of stock; beyond dividends, the balance of $15bn has been absorbed by a $170bn increase in risk-weighted assets (RWA) due to the advanced-approaches transition albeit offset by the $20bn benefit over the last 6 quarters from de-risking and optimization of the risk balance-sheet. With the regulatory transition completed by end-2015, we expect the return of capital to stockholders to increase $15bn in 2016 including $9-10bn of stock buyback. The increase in the net payout ratio, from below 25% in 2015 to 75% in 2016, is the largest in our coverage and a key factor in our favoring BAC over other bank stocks (Preferences Table). We have a price-target of $22 representing 1.3x end-2016 tangible book value of $16.7/share consistent with our forecast (Appendix) for the bank to generate a 2017 return-on-tangible-equity of 11%. Notwithstanding Governor Tarullo’s comments last Monday that “there will be some net increase in post-stress minimum capital requirements,” we believe BAC has substantial quantitative capacity for stock buyback in both 2016 and 2017, and that qualitative issues will not be a constraint. CEO Brian Moynihan is not hedging his bets on the outcome of the resubmission of last year’s capital plan around qualitative concerns given his comment on November 17th that “we continue to improve upon our strong quantitative results with getting strong qualitative results. We spent $100mm preparing ourselves for resubmission and we should hear from that in the next few weeks”. We expect BAC to buyback $9-10bn in each of 2016 and 2017, even allowing for an increase in the dividend yield towards 2% in 2017, raising the net payout ratio to 75%; the payout would be higher but for our assumption of negative other comprehensive income, as rising rates generate negative marks on the securities portfolio, of $4-5bn in each year albeit offset (from the standpoint of risk-weighted capital) by the issuance of preferred stock qualifying as additional tier-1 capital. The increase in payout ratio is important to valuation because, without it, BAC cannot raise its return-on-tangible-equity to 11% or above in 2017 and hence generate our target price of $22 representing a 1.3x multiple for price-to-tangible-book (Chart 1) and assuming end-2016 tangible book value of $16.7/share. The share buyback also has the effect of reducing the stock count by 4-5% in each of the two years which contributes in our model to a dime beat on 2017 EPS that we forecast at $1.83; the dime is split roughly evenly between our more-aggressive-than-consensus assumptions for stock buyback and expense-saves (and we are at-consensus for revenue and credit). Even if capital surcharges are fully incorporated into post-stress capital requirements, so that the minimum stressed ratio for BAC rises from 4.5% to 7.5% given the bank’s 3% SIFI surcharges under Fed rules (Chart 2), BAC had near-sufficient capital at end-2015Q2 under its self-reported mid-cycle stress test (Chart 3). Our model assumes that, by end-2016, BAC increases its common-equity-tier-1 (CET1) ratio to 10.8% from 10.4% at end-2015Q2 (Appendix) and that the additional 40bps is enough to meet the stiffened requirements for stressed capital. 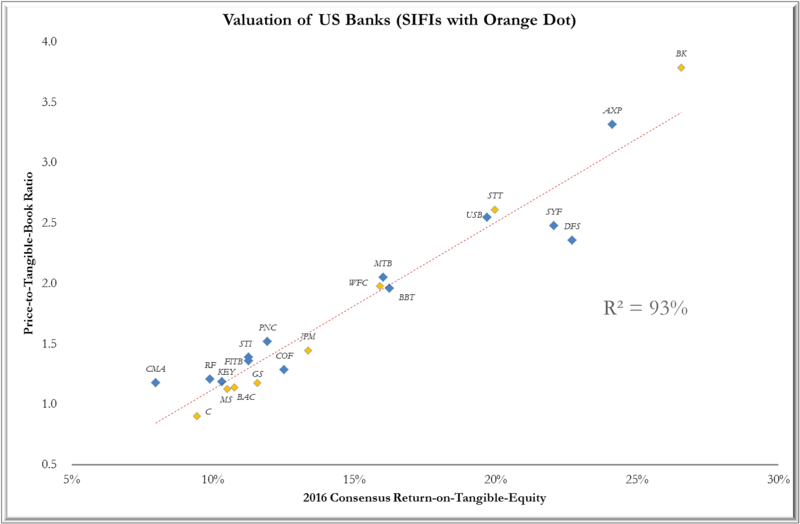 In practice, even if the surcharges are ultimately incorporated into post-stress minimums, we do not expect this to occur in time for the 2016 stress-tests although the prospect will likely influence bank submissions in the March 2016 CCAR round.